How do you put the risk from radon into perspective, especially since all homes contain some level of radon gas in them and there is no “safe level” except zero? 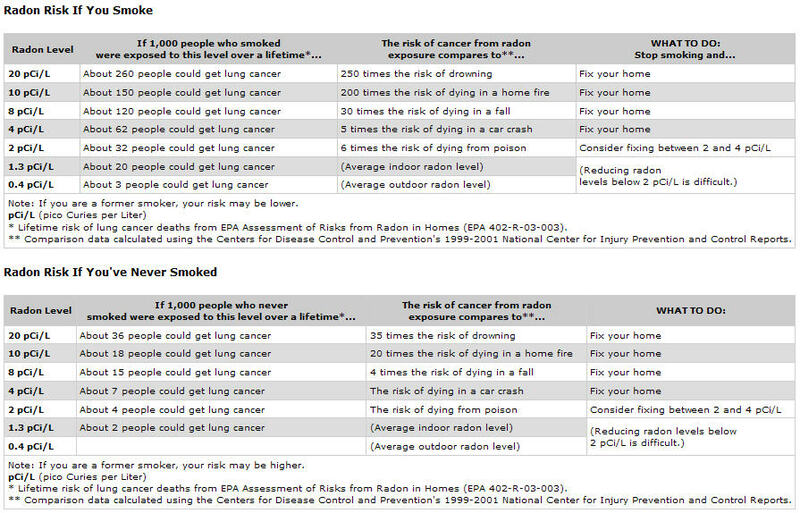 Notice that the risk for a radon level at the EPA action limit of 4 picoCuries/liter is similar to the same risk of dying in a car wreck. I have personally observed several residences that I have tested in Dallas county to EXCEED this limit including my own home. Acute Myeloid Leukemia (AML) 13 % – 25 % of all cases worldwide. This entry was posted in Indoor Air Quality (IAQ) Testing, Medical Illness Environmental Home Testing, Radon Testing Services and tagged comparison, Homes, lung cancer, radon cancer, radon gas risk, radon safety levels, residential on July 8, 2014 by admin. There are a variety of ways to monitor the radon levels in a residence, home or commercial building and the best detector for your needs depends on balancing cost, accuracy, ease of use and type of application such as a long or short term test. 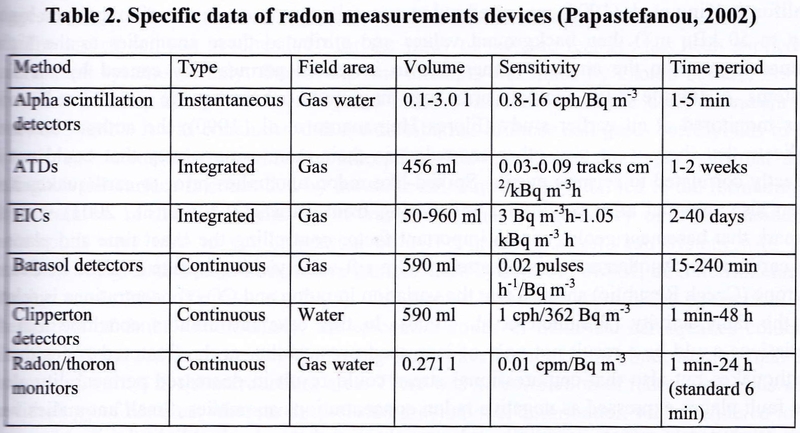 The chart below gives a comparison of different detectors including the time period duration during which radon is measured. This entry was posted in Indoor Air Quality (IAQ) Testing, Radiation & Radioactive Materials Testing, Radon Testing Services and tagged commercial, Homes, Radon level testing, radon testing, residential, safety levels on January 1, 2015 by admin. Higher energy efficiency construction in newer homes, buildings, warehouses, high rises and multi-family dwellings is causing greater health problems due to the hidden trade-offs and engineering compromises of "air-tightness" versus adequate ventilation for human habitation. While containing warm air in the winter or cool air in the summer may save money, the cost in environmentally induced medical illness can easily offset the energy savings and reduce quality of life. ScanTech is a specialty environmental, EMF, and biomedical testing company in Dallas / Ft. Worth that performs radon and indoor air quality testing. It gives greatly oversimplified answers to alleged effects based on solely on DISTANCE instead of actual ELECTRIC OR MAGNETIC FIELD STRENGTH. Welcome to the ScanTech Technical Consulting Facebook page. We are knowledgeable about environmental concerns that impact the health of you, your family and your employees. We specialize in radon and indoor air quality testing so please ask any questions you may have. Indoor Air Quality (IAQ) Testing Services (including chemicals / carcinogens like Formaldehyde) Available – Fast Onsite Results!